Can I force an online sync? Yes. You can choose to update family balances shown at TuitionExpress.com to match the balances in Procare. 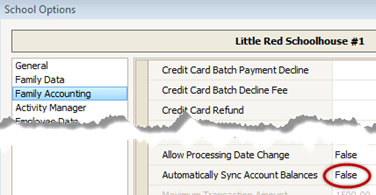 From the main screen of Family Data & Accounting go to Tuition Express > Force Online Balance Sync. This can be useful if you chose to turn off Automatically Sync Account Balances (set it to “false”) as explained in Tuition Express First Time Setup. What does "sync" mean? Can I turn it off?